The upgrades to the 2017 Ford Escape are numerous. Unveiled last year before the 2015 Los Angeles Auto Show in the state of California, U.S., the Escape gets a refreshed exterior, a redesigned interior and a couple of new engines for customers to choose from. A slew of new features and technologies will also be offered. The new driver alert system, for example, monitors driving performance to measure the driver's attentiveness of the road while the enhanced active parking assist makes parallel parking a breeze. Lane-keeping helps keep the Escape in its proper lane while SYNC Connect allows owners to remotely start the crossover's engine or even locate it in a crowded parking lot. A new Sport Appearance package, new wheel designs and new exterior colour choices (Canyon Ridge, Lightning Blue and White Gold) complete the crossover's major upgrades. The 2017 Ford Escape continues to be offered in three trim levels. A 2.5-liter four cylinder engine powers the base S. Rated at 168 horsepower and similar amount of torque, it carries over from last year's model. This includes the six-speed automatic transmission. Both the 1.5-litre and 2.0-litre twin-scroll four-cylinder engines are new for 2017. Both come from the automaker's EcoBoost line of powerful and fuel efficient turbo-charged powerplants. Horsepower and torque for the 1.5-litre are 179 and 177 respectively while the 2.0-litre drops jaws at 245 and 275. They are also paired to a six-speed automatic. Importantly, both come standard with Auto Stop-Start, a first for a Ford vehicle. This system shuts down the engine in specific situations to reduce fuel consumption. As Milton Wang, Escape chief engineer, said in a statement: "Auto Start-Stop is the equivalent of turning off the lights when you leave a room, or turning off a water faucet when you’re done washing dishes. It’s a high-tech approach to more efficient driving." To complement its primary role as a people mover, the 2017 Ford Escape comes with a slew of safety and security features. The standard stability control system comes with Curve Control, which assists drivers by slowing down the crossover in tight turning situations. The tire pressure monitoring system makes sure you never leave any of the four tires without sufficient air. Plenty of airbags minimize any potential passenger injuries in the case of an accident. The available all-wheel drive also increases safety by providing greater confidence and control while driving. This is especially true in adverse weather conditions like ice and snow. 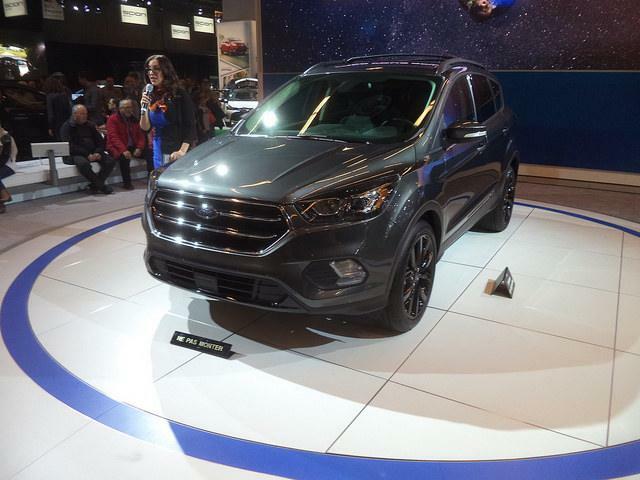 The 2017 Ford Escape is tentatively scheduled to go on sale in spring this year. Contact Us to test drive a Ford Escape today!